Given that poverty so strongly correlates to hunger and under-nutrition, we can hypothesize that such disasters can only increase the amount of hunger in these already impoverished areas. Furthermore, many natural disasters directly affect the food supply by destroying crop fields or disrupting local ecosystems. Thus, it is in our interest to devise and implement the most efficient and effective disaster response system possible. The present system of disaster relief focuses on short-term disaster management after the fact through individualized aid from NGOs and other governments. We proposing revising this system through a four-phase program of risk reduction, emergency identification, emergency response, and follow-up. By implementing our revisions, we hope to save money in the long-term as well as help rebuild the assets and livelihoods of those affected, reducing the total hunger level of a community during crisis situations. The first step in disaster prevention is reducing vulnerability, which can be done by improving infrastructure, education, food security, and other such factors that are addressed in our various solutions to hunger. 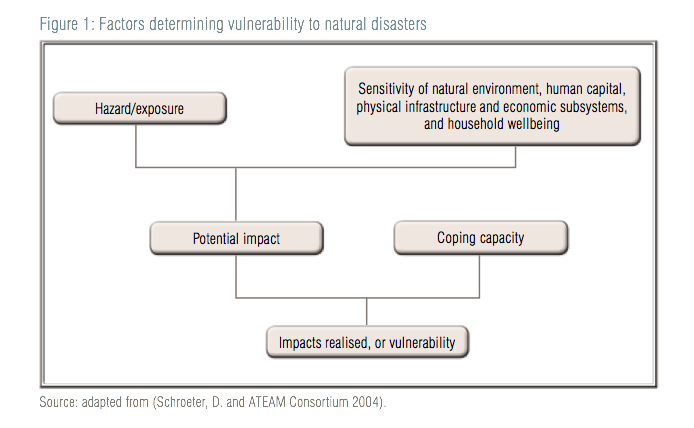 Currently, aid is disproportionately allocated towards disaster management over risk prevention. The United States federal government, for example, spent $3.05 billion on disaster response versus just $195 million on disaster prevention annually from 1985 to 2004 (Healy & Malhotra, 2009, p. 14). However, increasing risk reduction programs instead of waiting for disaster relief is economically more efficient in the long-run. According to Healy and Malhotra in the same paper on disaster response and prevention, spending an additional $1 on prevention is equivalent to saving $15 that would have to be spent on disaster relief (p. 18). Other studies have shown that $1 of prevention can save up to $40 (World Bank, 2006). Either way, the economic benefits of risk management programs in the long run are obvious. Indeed, the damage left by a category five hurricane that passed through Grenada and Bermuda in the early 2000s is a good example of these benefits. The hurricane caused no significant damage in Bermuda, where structures had been improved to withstand hurricane-force winds. In Grenada, however, the total estimated damage was roughly $1.2 million, about 200% of the Grenada GDP (World Bank, 2006). (Picture to left from ISDR, 2009). An earlier identification of emergencies would allow aid organizations to begin relief efforts sooner. As a result, these agencies would have time to coordinate responses and determine the most efficient and effective relief programs (see number three below). Furthermore, a faster response leads to more lives saved, as diseases and injuries could be treated before irreversible damage to the human body is done. Food and water could be distributed before malnutrition or thirst claims lives, infrastructure can be rebuilt sooner so hospitals can reopen and vital roads unblocked, and life-saving technology such as water filters and gas stoves could be distributed sooner as well. The economic consequences of a slow response are great, as in the case of the food crisis in Niger in 2005. Had the international community responded immediately, it would have cost only $1 per day to prevent the undernourishment of a child. By July of that year, malnutrition had already become epidemic and the cost to save an undernourished child was $80, much more than preventative costs (Meikle & Rubin, 2008). Currently, each nation has individual methods of declaring states of emergencies and response time between the national government and the passing of the disaster varies; for example, the response time for a regional disaster would be longer due to the need for communication between local and federal officials, for the local government to cede authority etc, while the response time for a tsunami sweeping over a smaller island nation would be immediate. The time between national governments declaring states of emergencies as well as NGO and foreign response also varies, depending on the scale and publicity of the emergency. In order to decrease these response times, it is crucial that all federal governments be prepared to act immediately and deploy troops and resources once a state of emergency is declared. It is also crucial that NGOs be prepared to respond and deliver aid as soon as a warning is issued. Local and federal governments should be encouraged to appeal for public aid during emergency situations, as this would push foreign nations as well as NGOs to action. Finally, considerable research and funding should be given to automated natural disaster warning systems such as the SCIER (Sensor and Computing Infrastructure for Envrionmental Risks), currently in development by the EU. These systems would notify government officials in real-time of disasters such as floods and forest fires, predict the outcome of the disaster without intervention, and give guidelines for a coordinated government response (ICT Results). One of our various solutions to the global hunger crisis is an International Policy Database in which each nation must post protocols for food distribution and agricultural growth that would aid in alleviating hunger within the nation’s borders. Each nation must also post a protocol for disaster management and preparation, to refer to in case of emergencies. NGOs and foreign governments should also refer to the individual nation’s protocol before giving aid in order to coordinate the most effective response and insure the respect of that nation’s sovereignty. In general, improving emergency response requires streamlining the aid process. The current system involves various NGOs and foreign governments working independently of each other, which often results in ineffective allocation of resources and redundancy. For example, in the aftermath of the 2005 Pakistani earthquake, hundreds of aid groups, government workers, and foreign citizens poured in to help in the recovery process. However, without the coordination of the various groups, some areas received a surplus of aid, while others were never reached. Although economists implored all of the groups to fill out simple forms detailing their actions, most agencies refused to cooperate (Banerjie, 2007). A global coordination system into which each NGO and government organization posts their aid efforts would greatly simplify the aid process. If the system shows that one region is receiving enough food aid but has no manpower to begin rebuilding structures such as hospitals and another region shows that it is receiving no aid at all, each agency can act accordingly and distribute resources and manpower where they would be needed most. In addition, non-governmental organizations should collaborate as much as possible by documenting their work and making it publicly available, as mandated in the NGO Protocol. They should work together to plan regional interventions along with national and local governments, assessing food supplies available in the wake of the disaster and determining the nutritional needs of victims before rushing in to help. Governments should also lower bureaucratic obstacles that impede NGOs. In order for aid organizations to gain access to disaster areas, for instance, they first must be granted visas by government authorities. While visas are usually granted immediately to aid workers or even waived at point of entry during natural disasters, there are still difficulties. Governments will sometimes deny aid personnel access based upon their nationality, or another cultural factor. Visas given in the form of tourist visas also cause problems, as they expire after a short period of time, causing workers to have to frequently leave and re-enter the country. To ensure organizations can respond as quickly as possible to disasters, the efficiency of the process of procuring these visas needs to be maximized. Flexible arrangements should be encouraged between governments and prominent NGOs to decrease the lag time between the actual occurrence of the disaster and the arrival of aid (International Federation of Red Cross, 2003). One of the most serious concerns after a disaster is providing potable water for drinking and bathing. Disruptions in water supplies and sewage systems can pose serious health risks to victims because they decrease the amount and quality of available drinking water and create difficulties in waste disposal. Drinking water can be contaminated by breaks in sewage lines or the presence of animal cadavers in water sources, allowing the spread of water-borne bacterial diseases. These disease, including worms and diarrhea, not only post serious health risks on their own but can also lead to malnutrition as the body is unable to process or effectively utilize nutrients provided through food (see Deworming). Thus, finding new and more efficient methods for providing clean water must be a high priority for aid organizations. One method, called SODIS for Solar Water Disinfection, requires only clear Polyethylene (PET) bottles and sunshine to filter water. Six hours or more of treatment by SODIS allows ultraviolet radiation to kill sufficient amounts of bacteria in the water for it to become safe for consumption. The method is particularly suited to the hottest and sunniest regions of the world. It also requires only plastic bottle distribution and education about the technique, which can easily be incorporated into our health education curricula (Swiss Federal Institute of Aquatic Science and Technology, 2010). (Picture above from www.sodis.ch). Two new technologies also caught our attention, one of which is currently in the last stages of testing before distribution. The latter technology involves purifying water using “tea bags” containing carbon granules coated with nanofiber-encapsulated microbicides. The second technology consists of cotton balls soaked in a conducting mixture of carbon nanotubes and silver nanowires. After connecting the cotton balls to a nine-volt battery, the combined electric current and solution can cause a 98% reduction in the bacterial content of contaminated water. Both types of filters can be produced for less than a cent each (Moyer, 2010). The other serious concern is meeting the immediate food needs of the population. It is generally best to provide food aid through local procurement of food or through cash payments. However, the desire for fast action in disaster situations often calls for a different approach, since local food supplies such as crop fields and fish farms may be disrupted or completely destroyed. Thus, providing immediate relief through direct food aid will generally be more effective. Aid organizations will also have the opportunity to draw on regional intergovernmental food banks to distribute direct food aid when necessary (see Regional Food Reserves). Current methods of distributing the food aid include food drops in inaccessible regions as well as tools such as food rations and a food voucher system. The WFP uses food rations in areas where the economy cannot sustain reasonable food prices and a food voucher system where the economy is still intact after the disaster and can handle an influx of free or dramatically subsidized food. These present methods will be used in conjuction with new such as Cash for Work or Food for Education, both described in our School Lunch Program solution (WFP and FAO, 2010). Aid organizations should evaluate and learn from response to disasters and their results. This will be aided by the online database, mentioned in NGO Protocol, Article 1, and our Impartial Evaluation Program.